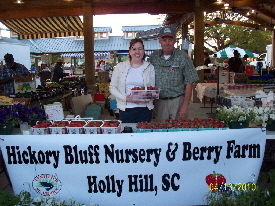 Hickory Bluff Berry Farm is Open seasonally from April - July. 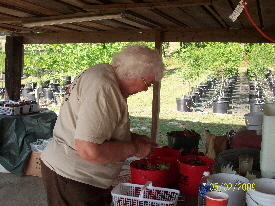 We offer U-Pick Strawberries, Blueberries & Blackberries and a Large Selection of vegetables during the season. For the Garden enthusiasts we offer a broad selection of garden plants, bedding plants, hanging baskets and cut flowers. Our Value Added products include local honey and jams and jellies made from our berries. If you can not get to our farm you can visit our booth at the Charleston Farmers Market or the Mount Pleasant Farmers Market.